LANCASTER —The project team for Wasteland: Turning Illegally Dumped Waste Into Art marked the successful completion of a three-month long environmental art project, which was developed by The Lancaster Museum of Art and History (MOAH) and the Eastside High School Art Department. The goal of Wasteland was to teach—through hands-on art making—as many students and community members as possible about the environmental, social, aesthetic and economic impacts of illegal dumping on our High Desert ecosystem. 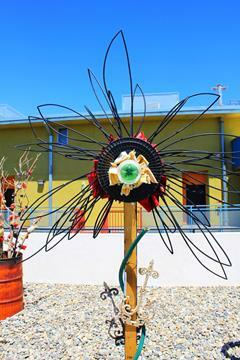 The Wasteland collaboration yielded a series of more than 70 large and small-scale flower sculptures made entirely from trash collected by Eastside High School students at illegal dump sites in the Antelope Valley. The project involved more than 600 visual and performing arts students, many who came to the project with little or no sculpture making experience. The students gained a great sense of achievement by honing creative problem solving skills throughout the project. The project was overseen by Monica Lynne Mahoney, MOAH staff member, and Robyn Young, Eastside High School Art Department Chair and Cross-Curricular Coordinator. 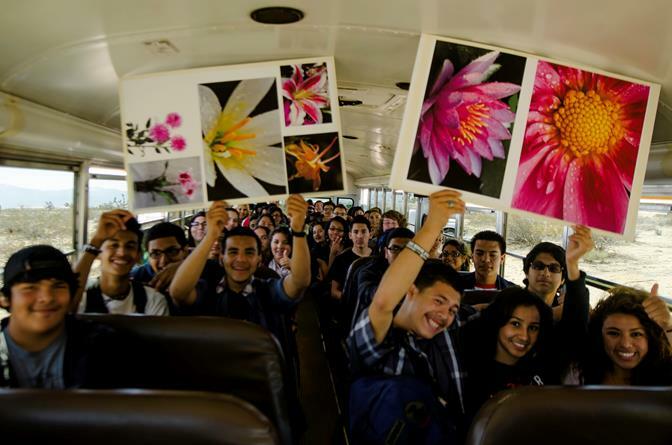 Together with the Eastside High School Art Department, the project was planned and implemented to meet and exceed state core curriculum standards as well as national museum accreditation standards. The success of Wasteland was evident in the number of campus-wide projects that emerged throughout the three-month process. 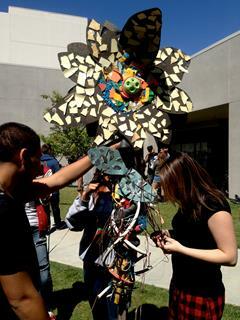 With the momentum and excitement generated by 600 students creating flower sculptures, Robyn Young invited and encouraged numerous departments at Eastside, such as Performing Arts, Health, Mathematics, Science and Government to engage in assignments that integrated the Wasteland learning objectives into collaborative experiences across disciplines. Graphic design students created eye-catching educational posters that were displayed at the Poppy Festival and the school’s Annual Arts Showcase. English students wrote and recited poetry and conducted spoken word performances about illegal dumping, while music students formed a percussion ensemble and performed on instruments made from the illegally dumped trash. Economics students chose a particular waste item, such as a discarded game console or joy-stick, and researched the object’s origin and manufacturing process. Students were invited to install their work at the Museum, transforming the entire MOAH roof deck into a sculpture garden. To top it off, media students are currently producing a documentary film on the entire Wasteland project. Wasteland is the first project of the Green MOAH Initiative. The Initiative is the Museum’s public engagement program that utilizes art and environmental education as a creative catalyst for living greener, more sustainable lives. Museum staff developed the initiative to expand the Museum’s hands-on arts education programming and to fill the need for multidisciplinary arts education in the Antelope Valley. Green MOAH was inspired by the City of Lancaster’s Net-Zero Power policy which has the goal of converting to 100% renewable energy sources by the year 2020. With the success of Wasteland, future Green MOAH projects will include wind energy, solar energy, water resources and sustainable design. The Wasteland project was selected for funding by a panel from the Antelope Valley Illegal Dumping Task Force (AVIDTF), and made possible by Los Angeles County Supervisor Michael D. Antonovich. In the spirit of building community partnerships, AVIDTF brought together many people from numerous institutions to fund the project. 2 comments for "Eastside High students turn illegally dumped waste into art"
this is great-is it still on display somewhere ? What about the mattresses and box springs dumped all over Palmcaster?